Every week, Image publishes a bevy of creator-owned comics that our fans are eager to enjoy and the press is eager to review. We’ve got a fast round-up of a few reviews that caught our eye this week, so if you’re on the fence for any of our titles, take a look at this selection of reviews and see if anything piques your interest. Maxwell Majernik of Comicosity praised the total package, and paid particular attention to Dragotta's contributions: "Dragotta is nothing but excellent in this issue. 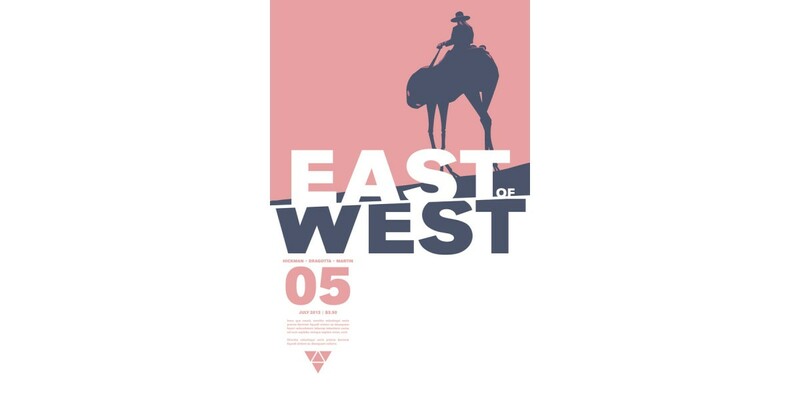 The detail and design are what make sci-fi stories stand out among the masses, and East of West is chock full of both. [...] There are so many hints of culture in each panel put into the character design and scenery that they go a long way in also telling the story." MrComicBook of Comic Book Therapy likes the pace of GHOSTED: "There is a big plot development late in the game, and I didn’t expect to have Williamson show us this type of reveal this early. It’s like he’s giving us a big bite of the carrot, and then smacks us in the face with the stick. A small thing that Williamson does is add the police as a potential threat. Too often in heist comics/movies, the police/security are morons and are easy to evade. While this is a story about stealing a ghost, this grounds the comic in a way. The group doesn’t just have ghosts to be worrying about." Forrest C. Helvie of Newsarama gave this issue a perfect score in a review released in advance of the issue's 8/21 release: "In all honesty, I continue to find this series to be one of the best on newsstands every month. Victor Santos and Serena Guerra’s artwork is dynamic and does an admirable job of capturing the reader’s eye in every panel. There are times in some comics where it is clear the pencils and inks lack detail and rely too heavily on the colorist to help flesh out the rest of the images contained therein. Not so with Mice Templar. Issue #6 is a great example of how this artistic team is truly performing together at their peak." Samantha Roehrig of Comic Bastards digs the way MIND THE GAP is progressing: "Mind the Gap grabs you right away in this issue and we get a reveal of some major players coming along in this game. It takes you on this conspiracy ride and the person sitting next to you holds flowers in one hand and knife in the other. The brakes are broken so just sit back and enjoy watching it unfold." Kelly Thompson of Comic Book Resources loved the latest issue of SAGA: "'Saga' remains, now 13 issues in, easily one of the best ongoing comics around. Vaughan and Staples have created a world that positively seethes with vitality and creativity. Like the best comic books, just when you think they've pushed as far as they can push, they break through and push to even greater heights." Jordan North of Comic Bastards enjoys the consistent thrills of SPAWN: "The kind of comics I’d sneak and read beside the pool at summer camp, the kind of characters and content that I’d swoon over and beg my mom to buy action figures of even though they were covered in blood and had gnarly looking weapons. And I love that I get that same sense of glee still, all these years later, every time I open one of his books." Joe Edward Lewis of Geeks Unleashed gave THE WALKING DEAD #113 some high praise, especially Robert Kirkman's contributions: "I can say the latest issue of Kirkman’s tour de force tortures and delights in equal measure and is possibly the strongest issue since 48. The creator toys with the reader, with the comic’s twists and turns. I picture Kirkman laughing maniacally, as I crawl the walls for more."